Update pictures: This options allows for designing and album and later retouching the pictures (with Photoshop or any other photo retouch software) and finally use this option to update all the pictures in the list and the designed sheets with the already retouched pictures, if you generate the sheets the new retouched pictures will be used. Remove selected: Deletes the selected pictures from the album database; it is only possible to delete pictures not used in any spread. and an option to select a brush to retouch the mask. Mask retouching only works in simple view mode and you have to press the spacebar while dragging the mouse over the picture. Edit, edits the picture with the integrated editor and updates it in the spreads where it has been used. Add frames (centered at border) and shadows to the pictures. Frames and shadows can be applied to the selected picture or to all the pictures in the sheet. Fit to picture, resizes the picture layer to fit the size of the picture and show the whole image. Convert pictures to black and white. Locked, locks the position and size of a picture. Bring to front a picture. This option is only needed on overlapped designs and one picture is hidden by another, with this option the selected picture comes to the front and is visible over all other pictures; to modify the visualization order of several pictures just bring them to the front in the desired order starting on the most hidden one until the front one. Save as template. Saves current layout into the layouts database of the application for reusing. Save as 2/3 template, saves the current layout for the 2:3 mode. 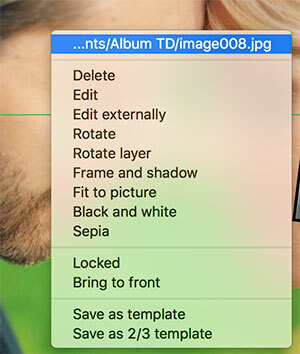 You should only use this option if you have designed the spread in 2:3 mode respecting the aspect ratio of the pictures. 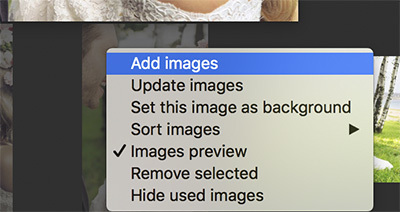 Remove background, removes the background from the sheet. Hue and saturation, opens a new window to set Hue and saturation for the background. 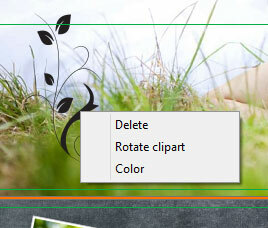 Delete: Allows to delete a clipart of the sheet and rotate it the indicated degrees. Remember that you may resize a clipart by dragging it with the mouse while you press the Shift key and reposition it by simply dragging with the mouse. Enables the text edition, selection of another color or font and to delete a text.Remember that you may resize a text by dragging it with the mouse while you press the Shift key and change the position by simply dragging it. Allows for deleting a template / layout from the list and enables showing of layout variations with vertically and / or horizontally flipped designs; variations are marked with a red triangle at the left top corner. By default layouts are shown taking account of the images orientation but you may enable showing all layouts independently of this orientation.